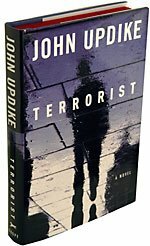 Campaign for the American Reader: "Terrorist"
John Updike's Terrorist is different from his previous twenty-plus novels: unusual for the author, plot rivals style in this novel and it reads much like a thriller. In my inaugural post at Spot-on.com I develop a few ideas about the novel and its place among Updike's work. My major point is that while Updike doesn't shy away from the role of religion in the making of the eponymous terrorist, this novel is really about America--or, to put it more broadly, the clash of modernity with the idea of purity in religious fundamentalism. I also offer a conjecture about what Updike had in mind in naming his protagonist. And while you're at Spot-on.com, click around and read the pieces about politics and current events offered by the site's various contributors. Chris Nolan, Spot-on's founding editor, shared her enthusiasm for a modern classic here. Deborah Klosky, who writes for Spot-on from Spain, came up with some suggestions for the series on what's at stake in the debate over habeas corpus which will appear here on the site in a few days. The novelist Michael Cunningham recently made a case that Updike may be our greatest living novelist; see here for that argument. John Updike or Tom Wolfe? Click here for my take.